WANNER INTERNATIONAL reports it has completed a major order to supply its Hydra-Cell metering and dosing pumps to a leading Russian oil refinery. The order comprised some 44 ATEX approved pump and motor sets along with mechanical speed variators, pressure relief valves and pulsation dampeners. In all, some seven different pump models were required for flows up to 4600 litres per hour and pressures up to 63 bar and all are driven by GOST Certified motors. 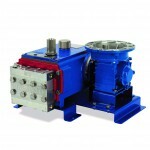 Hydra-Cell pumps have no dynamic seals and can therefore provide 100% containment of the pumped liquid.